Avlon came to CNN from the Daily Beast, where he was the head beast. In those days, he was one of those regular bobblehead “contributors.” Seriously. Every time a host or guest would make a derogatory comment about Trump, Republicans or conservatives, Avlon would give it his smarmy smile and his head would … well … bobble up and down. Avlon builds his case against Trump with selective facts, agonizing interpretations of those facts – while leaving out facts that refute those he presents – and outright disinformation. His “Reality Check” is not meant to educate the public – or to tell both sides of a story. It is to indoctrinate along the lines of the network’s various political false narratives. In short, Avlon is CNN’s chief propagandist. He earns that title despite intense competition form many of the other on-air personalities in the CNN stable. That definition, in and of itself, should elicit condemnation of the political theory but he failed to complete the definition. It is also defined as “a transitional social state between the overthrow of capitalism and the realization of Communism.” If you think that is not the ultimate goal, just listen to all those Democrats condemning capitalism these days. Avlon claims that all those examples of failed socialism that brought deaths and misery at the hands of brutal despots is … old news. Since World War II, he says that world poverty rates have been cut in half – implying that it was due to the rise of socialism in a few countries. Based on a reality check, it would be more accurate to attribute the decline in poverty on capitalism – with nation’s like China and Russia taking on more capitalistic policies. Avlon goes on to criticize Republicans for “crying wolf” over socialism. He points out that Social Security and Medicare were decried as socialist when they were proposed and now they are popular. Because they have become part of the American economic fabric – and have attained a level of popularity – does not mean that there were not steps toward socialism. They were. 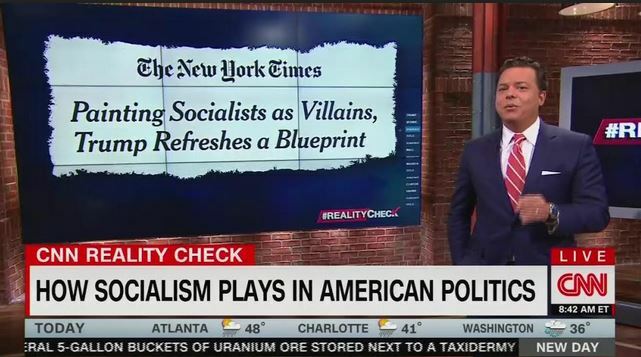 In his conclusion, Avlon declares that criticism of socialism in America is merely “political hype.” Just what a good left-wing propagandist would say.